Above: Latest renderings of the proposed Target Center renovation. 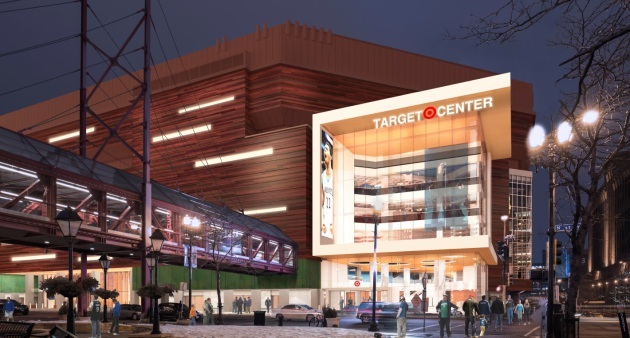 The $129 million renovation of Target Center is moving forward after the City Council granted its final approvals Friday morning. The vote authorized planners to proceed with the project, which will cost the city about $74 million from sales tax dollars. The Minnesota Timberwolves are kicking in $49 million, with Target Center operator AEG contributing another $5.9 million. The motion drew some critics who objected to the city pursuing the project while grappling with basic service needs, including shortfalls in parks and road funding. But supporters noted the city owns the facility, giving it an obligation to keep it competitive. The renovation will redo the exterior of the building, create a glassy new entranceway, add crucial loading dock space, reconfigure some interior fan areas and add more premium amenities. About $102.8 million of the $128.9 million cost, which rose last year, is for the construction itself, and the rest is for other project costs. Friday’s vote was a long time coming. The project was first announced in 2011 but faced a number of legislative and logistical delays. Construction is expected to begin in late spring and finish in late fall of 2017. Above: An original version of this post incorrectly said that Cam Gordon voted no on the primary Target Center motion.